One year after the partnership with Sony Pictures to promote The Da Vinci Code movie, Google has a new campaign, this time for The Bourne Ultimatum. 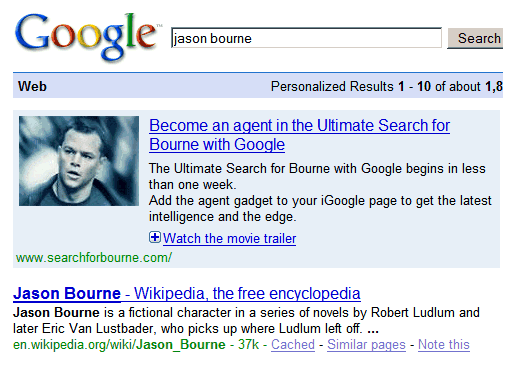 Searching for [Bourne Ultimatum] or [Jason Bourne], you'll find an undisclosed ad for the Ultimate Search for Bourne with Google, a competition that starts today in 7 countries: U.S., Canada, Australia, New Zealand, Germany, the U.K. and France. You'll probably find intriguing that "Google must provide Universal Pictures with the primary email address associated with your Google account for verification purposes". Besides the integration with Google accounts, a Google search box will help you find clues and a gadget for iGoogle will keep track of your scores. Apparently, the partnership between Universal Pictures and Google didn't involve money. It's just a way to create more awareness for Google's services. "This is a great opportunity for us to bring the power of Google search products to help players across the globe hunt for Bourne online. We're always looking for creative and engaging ways to connect people with the information they're seeking, and this collaboration is a terrific example of that," said Dylan Casey, product manager at Google. It's interesting to see a media giant and a technology company as partners in a viral marketing campaign that blurs the borders between advertising and real content. cannot be undertaken in Linux. wasn't google supposed to start offering more for linux users?!? From what I know, it wasn't Google that created the site. You can spoof the user-agent string. The site's script denies access to Opera and Linux users. Also, the site doesn't work with Opera. Kind of a let down, I must say. 2) Press F12 and select "Edit site preferences"
4) Choose "Mask as Firefox"
Seems a bit "evil" to me - Google is effectively cooperating with Universal Pictures to put their result at the top of the page. I agree with anonymous up there: spam in the results page. It's Day Four, one day behind Jason Bourne, two sightings of Jason Bourne already, and ready to fly to Morocco. Anyone find an actual use for the Image Filter yet? To those who kindly explained how to spoof the user-agent string for Linux and Opera (I use Linux on Ubuntu) I would say that it's rather missing the point. Why should I have to spoof anything, why can't they make it work on any platform and with any decent (standard adherent) browser. If they want me to participate in whatever promotion they're running, they need to make it work on my choise of browser and o/s, not the other way round. This is such a bad idea! Feeding advertising garbage like this (the plugin is advertised on the bottom of the page) to the Igoogle page does only harm to Google's reputation as a trustworthy service. Will we be seeing popups and forcefed Flash adverts next? Day 5: look at the third video from Dater Notes and concatenate the three numbers. You'll get a 5 digit number that starts with 123. Day 6: you're sent to this video and you have to connect the words: "Treadstone all lies". Day 7: Do a search for [treadstone all lies], copy the URL of the first image results in the image filter. You'll find the capital of an important country from Europe. Day 8: one of the two images from the Mastercard "Priceless" site contains the username (CRUYFF74) and a passphrase. 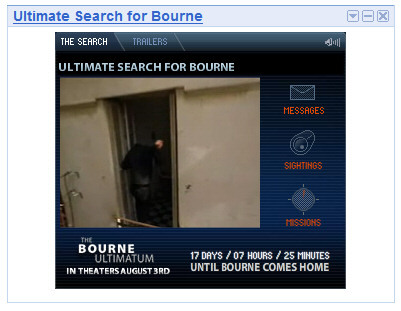 You'll get this message from Simon Ross: "You are one of the agents looking for Bourne? I may have some information. Contact me again tomorrow." * The first result is this image. Check the tips about waveforms distortion and detecting lies. * Go to your videos and click on the "Waveform video". * Notice that [Stay here] is the answer.